Sport utility vehicles, or SUVs, have been a popular choice for consumers for many years. Their large size and weight give the impression of protection in accidents and they offer sufficient room for multiple occupants and gear. Unfortunately, the high incidence of rollover accidents in SUVs belies its appearance of safety. There are about 8,000 to 11,000 fatalities from rollover accidents each year, with most occurring in SUVs. These vehicles have a high center of gravity, making them more susceptible to rollovers. Also, the poor roof crashworthiness in SUVs substantially increases the risk of occupants suffering a catastrophic injury by nearly 40%. According to statistics from the Insurance Institute for Highway Safety (IIHS), more than 50% of people killed in SUV crashes were from rollovers as compared to 25% for a typical passenger car. The decision by SUV manufacturers to not include a roll bar contributes to vehicle instability when turning over on its side or flipping onto the roof. Also, many SUVs have roofs which do not comply with NTSA standards, resulting in collapsed roofs in rollovers and failing to protect whoever is inside from traumatic head and crush injuries. SUVs have a narrow base width and sit higher causing the SUV to be top-heavy and prone to more rollovers than regular passenger cars with lower centers of gravity. They are also heavier than typical passenger vehicles and vans. The added weight above the vehicle’s center of gravity increases the risk of rollover. SUVs are used primarily for family use and not for off-road truck driving for which they were originally designed. Manufacturers removed the rollover bar for largely aesthetic purposes but without compensating for the loss of this valuable safety feature. 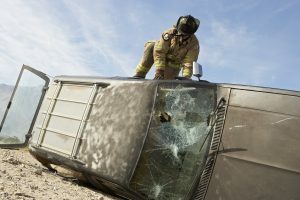 Most rollover accidents involving SUVs are single-vehicle incidents, occurring when its momentum and weight distribution causes the vehicle to roll over. Each SUV manufacturer is required to have sticker in each vehicle that warns the driver about using caution in making turns and that the vehicle handles differently from ordinary passenger vehicles. A large number of SUV accidents result from the driver losing control of the SUV, and the vehicle listing to one side due to its high center of gravity. Also, you and your passengers can be ejected from the SUV through its doors, windows or windshield. This is more likely to happen where there is a failure to wear seat belts. Ford, the SUV manufacturer of the Explorer, knew in the 1990s of the vehicle’s susceptibility to rollover accidents. When it installed its new suspension system in 1995 and in later model Explorers, evidence showed that Ford could have lowered the center of gravity in these vehicles but decided it was not cost-effective. At the time, Ford had a nearly 40% profit margin on the Explorer, one of its more popular vehicles. Surprisingly, Mitsubishi had developed an electronic stability system back in the 1990s that gave its vehicles better traction while cornering or while on icy or slippery surfaces. Despite its availability, it opted to not make it standard on its SUVs until 2008. Damages for medical expenses include not only current expenses, but future expenses. Your attorney will have to present expert medical testimony to show that your injury is likely to require future care such as additional surgeries, rehabilitative costs and any other attendant costs. The same principle applies to loss of earnings. If your injuries are so extensive that you can no longer perform your usual occupation, you are entitled to the earnings and value of the benefits you would have earned over your working life. If you are able to train for other work or to attend school, you can be compensated for these costs. In fatal accidents, the surviving spouse, children and any issue of deceased children may bring a wrongful death action for funeral and burial expenses, loss of financial support and loss of love, affection and companionship. The decedent’s estate may bring a survival claim to collect medical expenses and pain and suffering but only if the decedent survived for a time after the accident. Neil Burns and Roshan Jain are a Boston car accident lawyers, who has successfully handled numerous SUV rollover accident and catastrophic injury cases and has obtained the maximum compensation for their clients. Contact thhem today for a free consultation and assessment of your claim.